The P.K. Yonge robotics team qualified for the world championships by winning the Orlando regional competition in March. P.K. Yonge: Robotics world champs? Well, we don’t know yet. At this writing, P.K. Yonge Developmental Research School’s robotics team is competing in the FIRST Robotics Championship April 22-25 in St. Louis. The 21-member Roaring Riptide team qualified for the finals in mid-March by earning the top prize in regional competition held in Orlando. The event isn’t really billed as the “world” championship, but more than 18,000 youth from 40 countries–along with 800 robots–are competing. This year’s competition theme is “Recycle Rush,” so PKY’s team built its robot to stack recycle bins and move trash cans. The robotics competition helps students gain technical knowledge and skills and enhances their capacities in science and engineering. They also experience some life lessons on the value of collaboration and innovative thinking. The P.K. Yonge Roaring Riptide Team 4118 is enjoying great success and inspiring male and female students from 9th through12th grades. 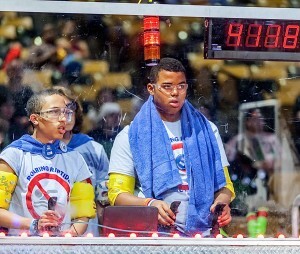 Introduced to the PKY campus in 2012, the FIRST Robotics League has allowed students to explore new opportunities, take on new challenges and think about their futures differently. FIRST Robotics challenges teams to design and build a robot–over just a six-week period. Teams are not only required to win in competitive events, they also must collaborate with other teams to secure top honors. The focus on collaboration is not only built into the competition, awards are given to recognize exemplars of collaborative spirit. In addition to its first place regional win, the Roaring Riptide received the Gracious Professionalism Award for their work with other teams throughout the competition. Team president Logan Hickox also was recognized as a Dean’s List Finalist.